Containing a variety of vegetables cooked together in a broth, vegetable soup is a classic dish. Vegetable soup recipes can be personalized with different vegetables, mixtures and seasonings that change the overall nutrition facts, but most vegetable soups contain vitamins and minerals along with a balance of carbohydrates, fat and protein. The total calories in vegetable soup will vary based on the ingredients, but most vegetable soups will contain about 50 to 100 calories per 1-cup serving. One serving of the Weight Watchers Zero Point Vegetable Soup, for example, contains 63 calories, with 73 percent coming from carbohydrates, 10 percent from fat and 17 percent from protein. The carbohydrates found in vegetable soup come primarily from the vegetables. Additionally, vegetables also serve as a significant source of dietary fiber. Condensed vegetable soup, for example, contains about 15 g of total carbohydrates, as well as 3 g of dietary fiber and 5 g of sugars. Protein can be found in select vegetables but will also come from any added beef or chicken products. Most vegetable soups contain low amounts of saturated fat and cholesterol. Due to the variety of vegetables included, vegetable soup can provide a significant amount of vitamins and minerals. The overall amount of vitamins and minerals is dependent on the selection, variety and amount of vegetables featured in the soup. The most common vitamins and minerals found in vegetables include vitamin E, thiamin, niacin, vitamin B6, potassium, copper, manganese and vitamin A. Vegetable soup is a low glycemic food because the majority of the carbohydrates are complex. One serving of vegetable soup ranks as a 6 on the estimated glycemic load, a unit of measurement used to determine a food's influence on the body's blood sugar levels. 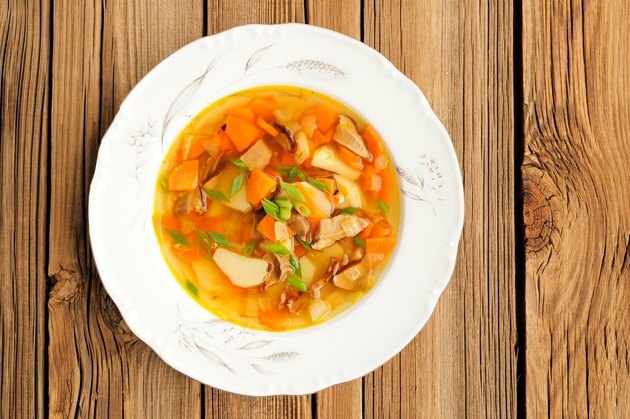 According to NutritionData.com, an individual's estimated glycemic load should not exceed 100 per day, so vegetable soup is considered to be low on the estimated glycemic scale. The inflammation factor, a measurement used to determine the inflammatory or anti-inflammatory an individual's response is to foods, is another effect vegetable soup has on the body. Vegetable soup is considered mildly inflammatory with an IF rating of -14. Similar to the estimated glycemic load, the IF rating has a target of 50 per day. Some vegetable soup recipes can provide excessive amounts of sodium. As a result, low sodium recipes are available that can reduce the total amount of sodium per serving from 890 mg to just over 100 mg.